Fencible soldiers were not only living at Panmure, Howick and Otahuhu. My great grandfather William Cassin was a sergeant Fencible stationed at Onehunga. 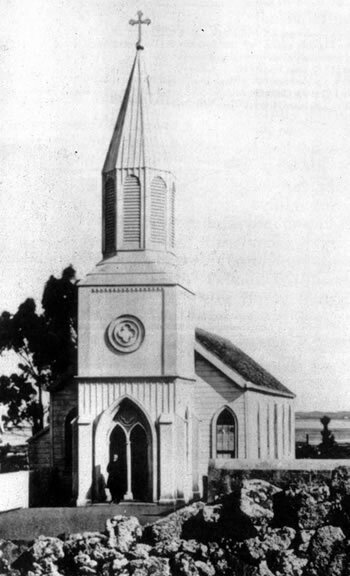 As with the other Fencible settlements, there must have been quite a large number of Irishmen, judging by the magnificent Onehunga Church of the Assumption with its tall spire still a landmark. inst Hone Heke was fought in 1845-6 around the Bay of Islands, which led Governor Grey, in 1846, to request a military force, as he was concerned about the ‘unrest’ between the Māori and the early settlers in New Zealand. The English Parliament, however, approved a detachment of retired soldiers to be known as ‘The Royal New Zealand Fencible Corps’ to be recruited and sent to New Zealand. ‘Fencible’ means ‘capable of defending,’ and the idea was to establish settler townships that could rapidly mobilise as a military force if needed. Conditions for enlistment for the Royal NZ Fencible corps were posted in every camp in the British Isles where Military Regiments were stationed. Some of those conditions were: the men had to be under the age of 48 years, and this was then lowered to 41 years, with a minimum of 15 years of military service. They needed to be over 5 foot 5 inches in height, of good character, industrious habits, robust frame, and be medically approved as fit for occasional military duties. Those approved would be enrolled to serve for seven years. They would receive free passage to New Zealand for themselves, their wives and families. On arriving in NZ each pensioner would be allocated a two-room cottage on an acre of land. Each man was required to attend military exercise for 12 days a year and a church parade each Sunday. At the end of the seven years of service the cottage and allotment would become the absolute property of the Pensioner. The offer was an attractive one, especially with Ireland experiencing the Great Famine between 1845 and 1852. Approximately half of the men who enrolled as Fencibles were Irish Catholics. William Cassin was one of those soldiers, arriving on the Oriental Queen on 18 September 1849, one of a complement of 71 ‘pensioners,’ 62 women and 108 children. Since last February I have been here in Auckland, capital of the British colony. It is a town of about six thousand souls of which about six hundred are Catholics. The arrival of the Fencibles must have had a huge impact. The Catholics among the Fencible families were English-speakers and largely Irish by nationality. Bishop Pompallier and the Marist missionaries, who were busy establishing the first Catholic Church structures in New Zealand, were Frenchmen who had come to Aotearoa to evangelise the rural Māori population. Yet Pompallier promised Governor Grey that he would supply priests to care for the new townships of settlers. Auckland is now a town of growing importance, since 3 other towns are beginning not far from the capital. 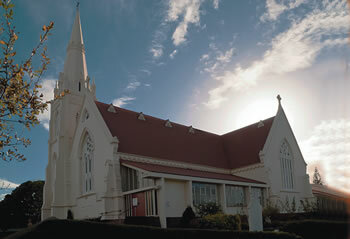 At Auckland, we have a beautiful big church of stone. On the other side of the harbour a big college called St Marys, also built of stone, on a property of 400 acres of very good farmland. Fr Petit-Jean and Br Florentin are living there. The Bay of Islands is only very slowly rising from its ruins. 200 soldiers remain at Wahapu to protect it, but now we have perfect peace and everyone is happy, white and black. There are only a few Europeans at Hokianga but on the other hand this station has developed considerably, thanks to the zeal of Fr Petit. There are a dozen cows or cattle, a water-wheel, and they are beginning a large schoolhouse capable of taking 100 to 150 children. He says the produce of the mill will provide ample food and clothing for them. The vines are also thriving. By the time the ships with the Fencibles arrived, the ‘unrest’ between Māori and settlers was in the southern part of the North Island. Auckland is on an isthmus – almost an island – with a narrow land connection to both north and south. The Fencibles were to be settled so as to be able to defend the southern connection to Auckland.